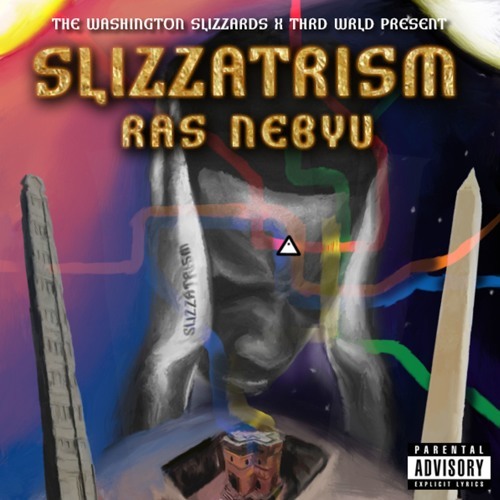 SLIZZATRISM (w/ The Arckitech & DJ K-Meta) EXECUTIVE PRODUCER: The Arckitech; Ras Nebyu Mixed by The Arckitech SLIZZATRISM is the third mixtape by Ethiopian-American recording artist Ras Nebyu to be released August 2016 by the WASHINGTON SLIZZARDS collective. Named after the philosophy of the collective, the word “SLIZZATRISM” is defined as “the art of finessing good energy to work in one’s favor via pure intent, meditation and the acknowledgement of the ancestors”. After spending a majority of 2015 releasing promotional singles and performing at numerous events/venues/shows across the east coast, Ras along with DJ K-Meta went to Abidjan, Cote D’Ivoire to open for Nigerian afrobeat pop-star WizKid. This trip to West Africa in the summer of 2015, as well as other circumstances in his life inspired Ras to make the mixtape. Recording sessions for the tape took place from April 2015 to June 2016 at Alladat Studios in Temple Hills, MD as Ras worked with childhood friend and longtime collaborator known as The Arckitech in producing, recording and mixing all the songs as well as contributing two guest verses of his own (“Story” & “Blazin’”). Primarily a hip-hop mixtape, SLIZZATRISM incorporates musical styles from soul, reggae and dancehall with additional production from Ibrahim Keita, Corbin Butler and Phil Oli on several tracks. Its lyrics touch upon life in Uptown, DC and the practice of SLIZZATRISM, along with themes of family, love and God.